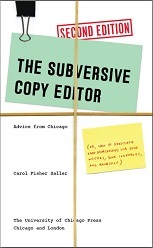 At her excellent blog, Love, Your Copyeditor, Ray Gunn recently wrote about the cons and pros (in that order) of having writer friends who need copyediting. Feeling the same way she does, I have made fun of this predicament. But Ms. Gunn’s more serious treatment reminded me of a related issue, which is that because I do what I do, I have a lot of writer friends. And they often ask me to read their work without my copyeditor’s hat on. I’ve read drafts of a play, a screenplay, novels, children’s books, blog posts, short stories—all with pleasure and admiration. Typically, there are at least a few ways in which I can query or nudge or misunderstand enough to provoke some rethinking. The challenge of approaching a work at a level that copyediting discourages, the big-picture level, is fun for a change. So, friends, please don’t ask me to copyedit your work. * The answer will always be no. But keep your stories coming. *You understand that this has nothing to do with your lifelong right to e-mail me for copyediting advice in exchange for your own expertise—be it legal, medical, culinary, computer tech, home repair. . . . In that regard, I’m pretty sure I’ll always be in your debt. — proofread the wrapping paper! Have you ever been partway into a freelance editing job only to find that it’s going to take a lot longer than you (or the assigning editor) thought? Maybe the tables are full of math errors, or the writing requires a lot of time-consuming head scratching and minor rewriting. If you exceed the estimated time, will the client think you’re exaggerating the problems to inflate the bill? Will they think you don’t know how to work efficiently? Which should you do: bill for the originally estimated time and take a loss, or bill for the extra time and risk alienating the client? Experienced assigning editors know that there are two kinds of projects: (1) the kind that deserves just about exactly the estimated number of hours, and (2) the kind that takes however long it takes. The problem is, how do you know which kind you’re doing, and if it’s type 1, how do you “work to rule”? Whether you’re working for a flat fee or by the hour, you can try to get a sense of a project’s importance by asking the assigning editor whether it’s okay if it takes longer than estimated. Pay close attention to her response. Not that she’ll come right out and give you permission to cut corners. Rather, she’ll let you know if the opposite is true: that it’s the kind of project that requires your best effort, regardless of cost. She’ll also know whether the schedule can be stretched. If it turns out that you’re expected to match the estimate, that’s what you should do. Working to a specified number of hours takes experience. Learn to monitor your progress and make adjustments: Fact-check less (if it’s not what you were hired to do). Identify tasks that you can automate. Make a decision to live with idiosyncratic styles if they are logical and consistent. I can hear you protesting, “No! We can’t lower our standards!” But let’s be reasonable. Some of our “standards” are just time-consuming habits that don’t really make a difference to the reader. Letting go of them gives us time for more important tasks—and if working for our employers means working to a schedule, working for the reader means using the time we have in the best ways possible. Besides, the manuscript doesn’t have to be perfect. Shocked? Don’t be. The manuscript does not have to be perfect because perfect isn’t possible. As I say in The Subversive Copy Editor, there’s no Platonic ideal for that document, one “correct” way for it to turn out, one perfect version hidden in the block of marble that it’s your job to discover by endless chipping away. It simply has to be the best you can make it in the time you’re given, free of true errors, rendered consistent in every way that the reader needs in order to understand and appreciate, and as close to your chosen style as is practical. You can fiddle with a text forever, but a client will only pay so much. Working to rule—with the reader in mind—is the best solution. The Iliad on an e-Reader? up his dear son he tossed him about in his arms, and kissed him. I don’t know about you, but I continue to hear grousing that digital delivery removes the “humanity” from writing. Nearly three thousand years ago, when the Iliad was first written down after being preserved for generations by vocal performance alone, no doubt many wondered how the silent markings could possibly convey the same effect. I might have been among them. The transition of the Iliad and the Odyssey to digital form for e-readers is trivial in comparison. To those who can find no humanity on their screens, all I can say is, look within. Not all style conventions make sense at first glance. Or second. Or ever. For instance, who thought up the idea of putting periods and commas inside the quotation marks whether or not they are part of a quotation? Other rules that have a stated logic are based on distinctions so subtle or tenuous you suspect that someone is just messing with you: Washington State, but state of Washington? Swiss Gruyère, but swiss cheese? It’s not surprising that writers sometimes feel like chucking the style book into the recycling. But understanding the reasoning behind a convention is an excellent antidote to frustration, and today I’m going to tackle an important one that continues to flummox writers: that is, why note and bibliography entries have different styles, and why that makes sense. We’ll use Chicago style, since that’s what I know. Mack Maccio, Zamboni Repair in the Home (Chicago: Bizbooks, 2002). Maccio, Mack. Zamboni Repair in the Home. Chicago: Bizbooks, 2002. Why the difference? To begin with, notes are usually written like sentences, so putting the first name first is natural reading order. Since periods signal the end of a sentence, they would be confusing in the middle of a note citation. Instead, the elements are separated by commas and parentheses. Try it: read the following note the way you would any sentence. 23. For more on getting rich quick, see Mack Maccio, Zamboni Repair in the Home (Chicago: Bizbooks, 2002), 42–56; and Dora Gump, Effie Thompson, and Clara Stubee, Counting Your Way to Blackjack Bucks (Las Vegas: HustlePub, 2009), xii. On the other hand, when you go to a bibliography, you expect to scan a list in alphabetical order. Putting the names in natural order would make that awkward. Instead, names appear as they would in an index, with the last name first. In a list it’s clear where a citation begins and ends, so periods may be used to separate the elements. Gump, Dora, et al. Counting Your Way to Blackjack Bucks. Las Vegas: HustlePub, 2009. Maccio, Mack. Zamboni Repair in Your Home. Chicago: Bizbooks, 2002. In another method of citing called the author-date system, the forms also make sense. In the text, works are cited concisely by (what else?) author and date (Maccio 2002), leaving the reader to find the full citation in a reference list at the end of the article or book. Maccio 2002 is easier to find if the dates are moved to the front. Gump, Dora, et al. 2009. Counting Your Way to Blackjack Bucks. Las Vegas: HustlePub. Maccio, Mack. 2002. Zamboni Repair in Your Home. Chicago: Bizbooks. I often preach that styles rules are flexible and made for breaking, but there are times when a style makes so much sense it would be dumb to flout it. Citation styles help readers absorb complex information. Learn one and you’ll gain polish and clarity in your work—and big sloppy kisses from your copyeditor. As a writer, I sometimes receive smart suggestions from readers or editors. They rewrite a line, ask a pointed question, or present an argument that prompts major rethinking: maybe an entirely new direction for a plot, or the elimination of a character. A writer should feel elated and grateful for such help, but it’s not always that easy. First we have to resent the suggestion a little and resist taking it. Then we have to kick ourselves for not thinking of it ourselves. Finally, when we know that we really, really want to use that idea, we have to wonder whether it’s fair game. Is it fair to take someone else’s idea? Does it make us less of a writer? Of course it’s fair. It’s a reminder that not even the greatest writers go straight into type without drafting and redrafting, editing, and revising. It’s part of the publishing process. If a reader, editor, or copyeditor is being paid to vet our writing, the whole point is for their work to improve our own. The continuing brouhaha over whether Jane Austen was edited baffles me, implying as it does that other writers weren’t. Amy reminds us that writing is a “communal art.” So if you’re a grateful writer, here are some ways to give back. —Take a few minutes to read any cover letter that comes with feedback from an editor. It probably contains instructions for reading and marking the manuscript, and it almost certainly contains a deadline. —Respond to every question or comment at the very least with a checkmark to show that you didn’t miss it. —If you’re happy with the feedback and there’s an appropriate place to say so in print (such as an acknowledgments page), include that reader or editor in your thanks.